Below is the first in a series of occasional articles introducing sanghas affiliated with San Francisco Zen Center in the Branching Streams network, to give voice to our growing dharma family and share the flavor of the Suzuki Roshi lineage as expressed in different locations. As Al explains below what practice is like in coastal Massachussets, he communicates something of the sangha�s true flavor and what is most important there. 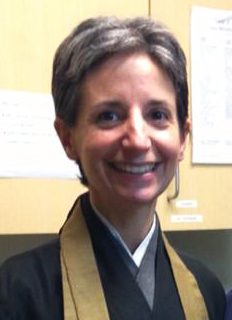 Because of our Guiding Teacher Joan Amaral‘s close relationship to San Francisco Zen Center, where she received her training, we at Marblehead Zen Center feel a great affinity for SFZC and its people. So it is with profound sadness, respect and admiration that we have held Steve St�cky in our hearts and minds during his illness and passing. He was such a powerful example of how to live in each moment! We are a fledgling rivulet less than two years old, and in our present location for only 11 months. Our present location is a bit unconventional, in that we are situated smack dab in the middle of St. Andrew’s Episcopal Church. The pastor and parishioners offered us space for our zendo and an office, and the experiment has worked quite well for all. When St. Andrews has an event, sangha members pitch in to help, and it is not unusual to see a parishoner joining in to sit zazen. Tuesday through Saturday morning, zazen, kinhin and service are available. Three afternoons per week there are sangha-led sits and discussions. Joan delivers a dharma talk most Saturdays unless we have a visiting speaker. We have also recently begun “Way-seeking mind” talks by sangha members. Yoga for sitters is also available, and Joan leads beginner and intermediate classes two evenings per week. 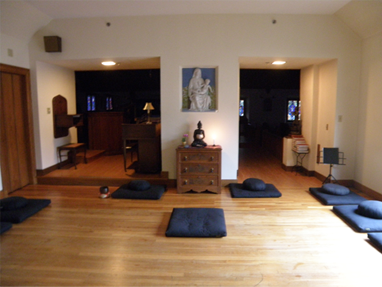 The first time I walked into the zendo I felt that I was in a sanctuary, not in the religious sense, but that I had entered a place of peace and silence. I still get that same sensation every time. The freshly sanded floors, newly painted walls and omnipresent fresh flowers (an offering from one of our members) add to the overall�picture. Over the past few months an evolutionary process has become most evident. Our numbers have grown, especially on Thursday nights and Saturday mornings.�On those two occasions we are stretched to capacity, and have thus begun to consider�a larger space. As much as St. Andrews has suited us so well, we need to look to the future.�We have begun to establish committees to plan for the future and handle circumstances professionally. A great boon to us all is having our guiding teacher available on a�full-time basis. This is a fortuitous situation and one we wish to continue.�We are very much a work in progress and are fortunate to have a core of talented,�dedicated people working toward a common goal. Altar (set up for a memorial service for Myogen Steve St�cky). 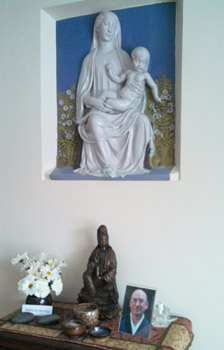 Every time I enter the zendo and bow, I smile at the bronze statue of Quan Yin�flanked by the Roman marble table my grandfather made many years ago. To me this�is the essence of Zen�all inclusive and ever smiling. A few weeks ago a lantern appeared�at dusk before our evening zazen, a perfect accompaniment to the moment. Things have�a way of arriving at our zendo just in time.�We are not sure where or when we will go, but I know that when the time comes�we will know how. We are honored to play a small part in carrying on the rich heritage of our�founder in America, Shunryu Suzuki Roshi. To be part of a Branching Stream emanating�from such a source is our good fortune! Visit SFZC�s website for a directory of Branching Streams sanghas, or for more information, e-mail us at branchingstreams@sfzc.org. For more about MZC, visit marbleheadzencenter.org. 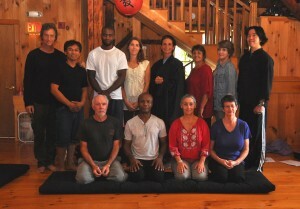 Group from a one-day sesshin in 2011. Photo courtesy of Chris Triplett.